A big hat tip to Feministe for this original post. I’m blown away. 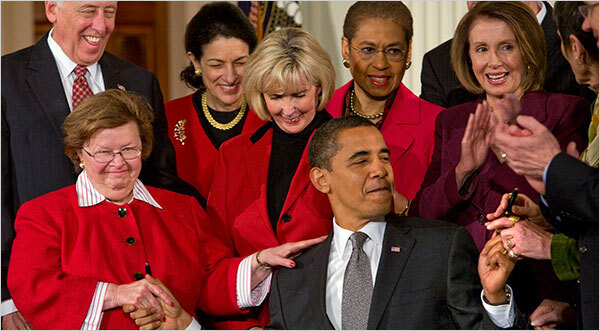 Two of the most important women’s-rights-related bill-signings in the past few years. Did Obama lift some sort of suits-in-colors-other-than-black ban? Um, yeah…that was the big difference. Kudo’s to Obama for the Ledbetter act. Equal pay for woman has been an issue for a long time and maybe the ability to sue will force companies to act before it comes to that. As far as Bush, I am torn. I am pro-choice, but at what point do we look at viable life? That is much more complicated to be “on a side” for or against. 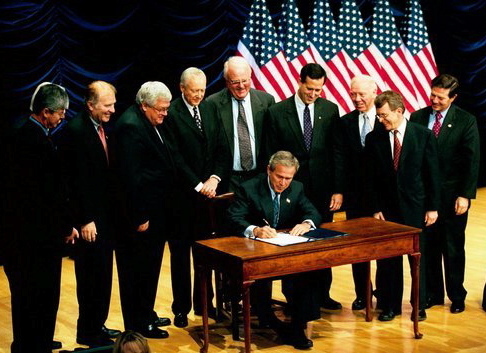 Not to sound like captain obvious but given that these were both huge women’s rights bills, I think my key takeaway from these pics is in Bush’s case he was starkly surrounded by a bunch of old white men while Obama is in the center of a throng of celebrating women. I just can’t think of a more compelling way of contrasting the attitudes towards women of these two administrations. I might have caught that if Bush had been surrounded by Pigs. Oh, wait a minute, he WAS….. I think my key takeaway from these pics is in Bush’s case he was starkly surrounded by a bunch of old white men while Obama is in the center of a throng of celebrating women. That’s what jumped out at me. Thanks for putting a huge grin on my face after a long and exhausting day! Wow. I find the Bush pic really sinister…chilling. Here comes the sun, let’s hope. Thanks for getting it, SJ. And another thing. To Barbara, and anyone else struggling with the misconception that pro-life legislation is motivated by anything other than repressing women, just take a look at that pic. Mr. Super Deity, knowing what you know about men and women’s hard-wiring, do you honestly think that any one of those guys gives a flying fig newton about babies? More than the potential mother whose choice they are trying to restrict? But don’t listen to me. If you want the truth, go to the source: George Carlin. I think you’ve posted Carlin’s “pro-life is anti-woman” bit before, but it’s worth reviewing. Barabara, the question of “viability” is not difficult or particularly debate worthy. The age of viability changes along with medical advances, but it is measurable and not all that controversial. I think what you mean to address is the question of a woman’s sovereign right to make decisions about her body and her health versus the survival rights of an unborn potential human, and you seem to be implying that age of viability is a reasonable factor to consider in reaching some verdict on this issue. You seem to be suggesting that at some developmental stage, perhaps at viability, the potential human becomes a certified human, and that at that point the newly certified human’s rights to survive trump the woman’s rights to health and/or control over her body. I argue that viability is an inadequate, if convenient, measure upon which to pin a resolution to such a complex problem. There are too many variable circumstances and conflicting human rights. We don’t even know how to begin to assign an age at which a potential human becomes a human. It is simply beyond our understanding. What is clear is that those bozos are in no way to be trusted to make such decisions. That’s the point the pro-choice movement has been trying to make for forty years, and which the above photo illustrates so effectively. Barbara, I’m glad you’re pro choice but don’t muddy the waters by confusing complex ethical issues with extremely clear political ones. These “bozo’s” that made this decision included women. They weren’t part of the picture, but they were part of the vote. There were several Democrats that voted yes on this bill as well. They weren’t in the picture, but they as well might have had the same ethical qualms about this as I do. Unless I’m mistaken a baby who is born alive is a viable life, even if it means this child will have to be given medical assistance to survive. I disagree with a medical procedure that would end a life after birth. Simple as that. This legislation protects women who have health care risks. I have no argument with that and wouldn’t support legislation that wouldn’t cover that. So I disagree that this legislation is just about repressing women, though that may have been the agenda of some of these folks. Just take a look with me real quick, the only man other than President Obama, that you can see in the photo, has the biggest smile on his face in the history of the world. For being a man, he sure is happy about the rights of women. By the way, this is a big deal for women. It’s a big deal…and it’s about time. About time that women got a fair shake.But we still got a long way to go. That is true too, and not just for women. Looks like the biggest difference is lack of American flags. Shows you how much more patriotic old, white republican men are. I have to agree with Barbara. I too am pro-choice and always have been but, I do have a problem with partial-birth abortion when not neccesary to protect the mothers health. It is a tough call, but because modern medicine has progressed to this point, I think we have an obligation to put some resrtictions on such a serious decision. I do however, strongly believe that this is a privacy issue and I regret that any legislation over individual privacy has infiltrated our political system. Barbie is getting angry, I miss you Barbie. Anyway move away from the US and most of your problems will be solved. I am pro-death or pro-choice whichever you like better. The government has no place in your uterus, period. This opens the ugly door to so many more interferences by the government. As for Husein Obama he is very clever and smart but is he bona fide. I’m sure you’re just being unsuccessful at making a joke but I do hope you’re not insinuating harm should come to President Obama. I’m all for freedom of speech but I have no qualms about sharing IP addresses with the all relevant branches of law enforcement in the interest of protecting our president (and anyone else) from threats of violence. I’m all for a spirited and irreverent debate but all are well advised to keep any comments that could be construed as a physical threat of violence to yourself. re: Ocenon: The government has no place in your uterus, period. This opens the ugly door to so many more interferences by the government. Also, what is a bona fide? I’m still around Ocenon…..stop by and say hi. You know my hang-out. As far as my uterus, your right, but what about when it’s not in my uterus anymore? That is the larger question and the point of where it becomes an ethical issue. It’s open for discussion though.